Great Sand Dunes National Park, located in the state of Colorado in the United States, encompasses an area of 340 square kilometers (130 square miles, or 85,000 acres) of magnificent sand dunes. The 12,000 year old sand dunes include the tallest dunes in North America, rising 230 meters (750 feet) above the valley floor. The park contains other landscape features found in the high desert, such as alpine lakes, tundra, forests, grasslands, and wetlands, all of which provide habitats for many kinds of wildlife. Visitors to the park can enjoy hiking over the dunes, though it is wise to either keep the visitor center in sight, or bring a compass, as there are no marked trails on the ever-changing dunes. 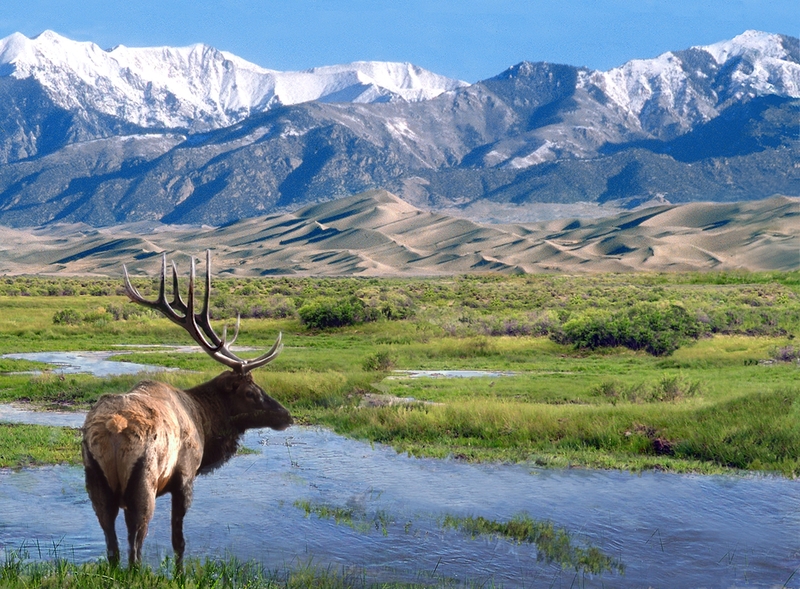 The closest town with accommodation is Alamosa, 30 miles southwest of the park. There is also tent camping available within the park. The nearest international airport is located in Denver, the capital of Colorado, which is a 4 1/2 hour drive from the park. The pictures are beautiful. Does anyone know the best time of year to visit the dunes? Is this part of the state that gets cold? Also, are there guided tours? Thanks. This part of the state DOES get cold and does receive snow in the winter. Also, like most of the state it’s at a high altitude. Summer is a great time to visit, though afternoon storms can force you off the dunes. 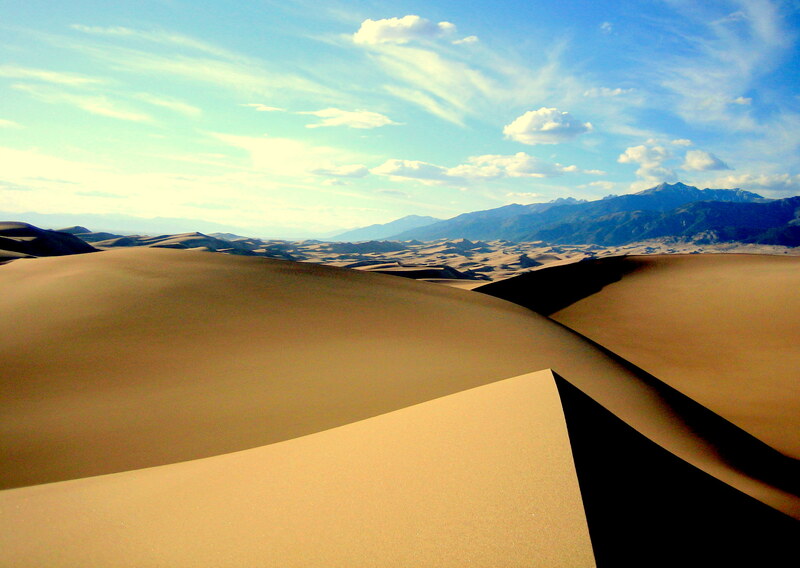 I live only about 10-miles outside Great Sand Dunes Nat’l Park, elevation around 7660-ft. Yes, it gets cold here (often the coldest area in the state), often below 0 at night in winter. In summer, it is usually in the 40’s, sometimes 30’s (F) at night. BUT there is abundant sun, average of 360 days of it per year, & the air is very dry. This makes it not so intolerable, & it warms up quickly once the sun pops over the mountaintops each morning. We do often get high winds, especially in the afternoons, so the BEST time to climb the dunes is in the MORNING no matter the time of year. Our “monsoon season” is July-August, when afternoon thunderstorms are more likely (with lightning), which is also makes it better to climb in the morning. The sand gets VERY hot (often 140-degrees) in summer, so other times of the year are better…but if you must go in summer, go early. Wear LOTS of sunscreen, carry water & wear hiking boots. There is not a guide service, you just strike out on your own. There is a visitor center with rangers on-duty, so plenty of people who can answer questions. My personal opinion…the most beautiful time of year is fall (last part of September thru early October), when the aspen trees are in color & there is also usually snow way up on the peaks. Close behind that is winter…it is simply magical to see the dunes covered with snow. We do get snow, but usually not a lot at a time, & it usually melts the same day that it falls due to the dry air & abundant sunshine. But visiting any time is better than not visiting at all! 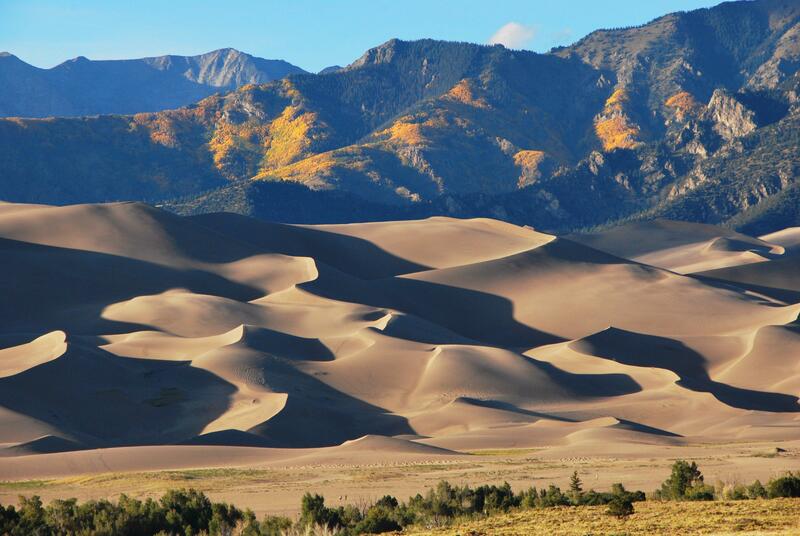 Admission to Great Sand Dunes Nat’l Park is $3 per person, or you can purchase a pass for $15 that is good for a year for yourself & all passengers with you in your car.